For the mobile telephone operating system, see Openmoko Linux. Neo FreeRunner, an open source smartphone created by the Openmoko project. Openmoko was a project to create a family of open source mobile phones, including the hardware specification, the operating system (Openmoko Linux), and actual smartphone development implementation like the Neo 1973 and Neo FreeRunner. The whole project was sponsored by Openmoko Inc. The first sub-project was Openmoko Linux, a Linux-based operating system designed for mobile phones, built using free software. The second sub-project was developing hardware devices on which Openmoko Linux runs. The first device released was the Neo 1973, in 2007, which was followed up by the Neo FreeRunner on 25 June 2008. On 2 April 2009, Openmoko suspended development of their third device, codenamed GTA03, to focus on the FreeRunner. In 2010, development of the GTA03 was continued by Golden Delicious Computers under the new codename GTA04, which includes major hardware revision, and the first unit was shipped on 10 October 2011. Unlike most other mobile phone platforms, these phones are designed to provide end users with the ability to modify the operating system and software stack. Other Openmoko-supported phones are also available. Project Openmoko was announced 7 November 2006 by its founders First International Computer (FIC). The Initial core team for Openmoko project included Werner Almesberger, Michael Lauer, Sean Moss-Pultz and Harald Welte. The name Openmoko is an acronym for Open Mobile Kommunikations. The codename for the phone product series, GTA, is an abbreviation of "GSM-TI-AGPS" which indicates the main components of the phone. Originally Openmoko Inc. developed its own operating system for the phones, which was called Openmoko Linux or Om. It uses the Linux kernel, together with a graphical user environment built using the X.Org Server. The OpenEmbedded build framework and opkg package system were used to create and maintain software packages. The initial version named Om 2007 used the GTK+ toolkit and the Matchbox window manager. Om 2008, which was released in August 2008, added support for the Qt toolkit and Enlightenment 17. Despite continuous improvements both of these versions did not reach a stable state. As a result, Openmoko started developing Om 2009, which had the goal of providing a stable environment based on the middleware from freesmartphone.org, a project that was financed by Openmoko. However, this version was not finished either, and in April 2009 Openmoko cancelled the development of software. This task was taken over by a several efforts of the community. Several groups have created modified versions of the original software or ported other systems to work on the phones. Among others, the Openmoko phones now support Android, Debian, Gentoo, Qt Extended Improved, QtMoko, and SHR. Openmoko hardware aspires to the term open-source hardware although in various areas the availability of cell phone components and legal requirements prevent full conformance to this term. As do many other vendors, Openmoko Inc., notoriously failed to meet the publicly announced hardware release dates, and postponed releases many times. The first supported phone, the Neo 1973 GTA01 (version: Bv4), was distributed exclusively through openmoko.com from July 2007 to February 2008. The second revision of hardware based on the GTA01 design is the Dash Express, an automotive navigation system. The Dash Express has a faster CPU (Samsung 2440) and Wi-Fi ability. The third hardware platform, the Neo FreeRunner codenamed GTA02 is an improved version of the Neo 1973. The Neo 1973 (codenamed GTA01) phone was a "developers only" release. The device is named after the first year of cellular telephone communication: the inventor of the cellular phone, Martin Cooper, made the first call in 1973. The phone released was inconsistently-named Neo 1973 or Neo1973. The Neo 1973 was sold from July 9, 2007 to February 2008. It was priced at US$300 for the basic model, or US$450 for a kit including more tools for hardware work. The initial releases of the Neo 1973 were hampered by supplier shortages, which forced the shipping date to slip, and hardware development difficulties exacerbated by the small size of the core team. Furthermore, other platforms have been ported to the Neo 1973, including Qt Extended, Debian and Android. The phone supports the 900 MHz, 1800 MHz and 1900 MHz GSM frequency bands. Many Linux and unix programs used on desktop and server platforms, including utilities and games, have been successfully run on the phone. In addition to Linux, the NetBSD, FreeBSD and L4 kernels have been adapted by users to run on the platform or are under development. This hardware platform can be emulated in software with a high level of compatibility using a version of QEMU included in the Openmoko software suite. Shortly before the shipping of the successor, the Neo Freerunner, the OpenMoko project released the CAD files, the schematics and other development resources of the Neo 1973 and Freerunner under a Creative Commons license, the CC BY-SA 3.0. The schematics are available for download from OpenMoko and Wikimedia Commons under a Creative Commons Attribution ShareAlike license. 2.8 in. VGA (480×640) TFT, 286 pixels/in. The Neo FreeRunner (codenamed GTA02) was the successor to the Neo 1973. The changes include a faster processor (clocked at 400 MHz), 802.11b/g Wi-Fi, two accelerometers and 3D graphics acceleration. It was released for the mass market on 25 June 2008. It was intended for users with a high demand for customizability. 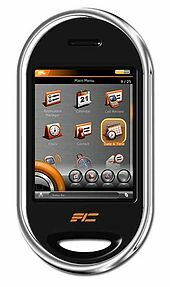 The Neo FreeRunner started shipping on June 24, 2008 and was priced individually at US$250 and at US$200 each if purchased in multiples of five. A debug board is available for US$99. 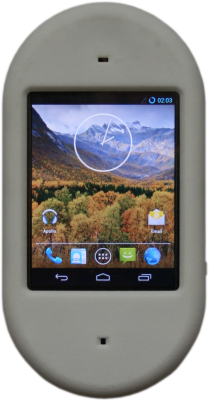 The Neo FreeRunner includes features that were not present in the development release of the phone (Neo 1973). The changes include 802.11 b/g Wi-Fi, SMedia 3362 graphics accelerator, two 3D accelerometers, Samsung 2442 SoC, and 256 MB of flash memory. As of the 2008.08 software revision only the GSM phone module is working reliably; the Freerunner's hardware does not yet have fully functional software interfaces. The software development is split between Qtopia under X11, GTK+, FSO, Debian. There are also some derivates of the Openmoko main distribution SHR and FDOM (Fat and Dirty Openmoko). The vanilla Qtopia distribution is recommended by Openmoko for users not wishing to use early development stage software, and FDOM for those who want to test the latest features and fixes without worrying about stability. It is also possible to run Inferno on OpenMoko Neo FreeRunner. Android has been patched to run on the OpenMoko Neo FreeRunner by at least two different developers. OpenWrt can be compiled for the Neo FreeRunner. The Neo FreeRunner makes an appearance in William Gibson's 2010 novel Zero History, as the phone initially used by the character Milgrim. On 2 January 2008 the Dash Express, a GPS device, with hardware developed by Openmoko Inc. was announced running Openmoko Linux. This device, initially codenamed the HXD8, seems to use little or none of the openmoko user-interface, simply using patches to the kernel developed by Openmoko Inc, and running an application from Dash Navigation on it to provide navigation and a user interface. There is a lack of reference material for what happened to the GTA03 (codename of 3D7K). Openmoko built 3 working prototypes which had capacitive touchscreens and a fully transparent curved case . The latest product from Openmoko Inc. was the WikiReader, a device to read Wikipedia articles offline. The German engineering firm "Golden Delicious Computers" began producing the GTA04 with an 800 MHz Cortex-A8 ARM (1 GHz) processor, an 800 MHz C64x+ DSP (digital signal processor) core, and a 3D graphics accelerator. With those specifications and the 512MB RAM combined with 512MB NAND Flash and 32GB expandable microSDHC, it would have been similar in performance to the iPhone 4 and iPhone 4S. Golden Delicious GTA04 board is designed to exchange the GTA02 board in the Neo FreeRunner housing - and the GTA01 board in the Neo 1973 housing. This was a release of the Openmoko Beagle Hybrid, a platform using the Beagle Board as a basis for developing and prototyping a next generation Openmoko phone. The following month, Golden Delicious stated their long-term goal of bringing such a phone to market. The new GTA04 board fit into the Neo Freerunner case and connected to the existing display and other components. The first batch of GTA04A3 EA (early adopter) started shipping on 10 October 2011. Version GTA04A4 first batch started shipping on 31 January 2012. The design for the next revision, GTA04A5, contained some minor but relevant upgrades in design and parts, and replacement of end-of-life components. The production was crowd funded. It is also possible to order a ready made phone called OpenPhoenux or GTA04 Complete. well documented building blocks so user allowed to write his own boot loaders and kernels. ^ "[openmoko-announce] Free Your Phone". Retrieved 16 August 2015. ^ a b "Neo1973". Openmoko Wiki. Openmoko. 21 May 2008. Retrieved 25 June 2008. ^ "Neo Base". Openmoko. 2008. Archived from the original on 22 June 2008. Retrieved 25 June 2008. ^ a b "Open source phone goes mass-market". LinuxDevices.com. 25 June 2008. Archived from the original on 4 January 2013. Retrieved 4 July 2008. ^ "No More OpenMoko Phone". ^ "Openmoko Phone Not Dead After All". ^ "Openmoko supported devices". Archived from the original on 5 September 2015. Retrieved 16 August 2015. ^ "Openmoko mailing list". Archived from the original on 23 July 2011. ^ "Cheap, hackable Linux smartphone due soon". Archived from the original on 29 June 2012. ^ "Open Moko Announces the World's First Integrated OpenSource Mobile Communications Platformat OpenSource in Mobile Conference in Amsterdam" (PDF). Archived from the original (PDF) on 7 August 2008. ^ GTA03 or 3d7k? Archived 23 July 2011 at the Wayback Machine. Lists.openmoko.org. Retrieved on 2013-09-19. ^ Shiloh, Michael (8 February 2008). "GTA02 Battery Capacity (Was: Re: More about the GTA02)". openmoko-community (Mailing list). Archived from the original on 16 February 2008. Retrieved 21 February 2008. ^ Moss-Pultz, Sean (25 April 2007). "Some light ahead..." openmoko-announce (Mailing list). Archived from the original on 2 July 2007. Retrieved 30 June 2007. ^ "openmoko.com | Download". Openmoko. 2009. Archived from the original on 22 August 2008. Retrieved 4 January 2009. ^ "Category:Openmoko schematics". Wikimedia Commons. Wikimedia Foundation. 2009. Retrieved 4 January 2009. ^ Moss-Pultz, Sean (3 January 2009). "Questions and Answers". openmoko-community (Mailing list). Retrieved 18 February 2015. ^ "SHR - Openmoko". Wiki.openmoko.org. 30 September 2010. Retrieved 19 August 2013. ^ Mosher, Steven (11 April 2008). "GFreeRunner Pricing and PVT update". openmoko-community (Mailing list). Retrieved 12 April 2008. ^ "Group sales - Openmoko". Wiki.openmoko.org. 17 October 2012. Retrieved 19 August 2013. ^ a b Moss-Pultz, Sean (28 June 2007). "New Oceans". openmoko-announce (Mailing list). Retrieved 28 June 2007. ^ Debian On the Openmoko Neo FreeRunner Phone, Slashdot article. ^ "inferno-openmoko - inferno for openmoko neo freerunner - Google Project Hosting". Code.google.com. Retrieved 19 August 2013. ^ "Android - Openmoko". Wiki.openmoko.org. 9 January 2012. Retrieved 19 August 2013. 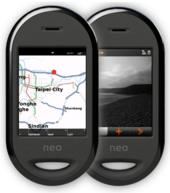 ^ "Openmoko Extends Mobile Phone to Power Next-Generation Dash GPS". Reuters (press release). 2 January 2008. Archived from the original on 10 January 2009. ^ Openmoko smartphone reborn as hackable GTA04 - News - Linux for Devices. Archive.is. Retrieved on 2013-09-19. ^ Openmoko, Inc. | FreeRunner Distributors. Openmoko.com. Retrieved on 2013-09-19. ^ "[GTA04] When is the next and more powerful openmoko releasing". Archived from the original on 3 March 2016. Retrieved 16 August 2015. ^ "[Gta04-owner] ANN GTA04A3: Milestone reached!". Retrieved 16 August 2015. ^ "[Gta04-owner] GTA04A4 starts shipping tomorrow". Retrieved 16 August 2015. ^ Golden Delicious Computers GmbH&Co. KG. "GTA04A5". Retrieved 16 August 2015. Wikimedia Commons has media related to Openmoko. Wikimedia Commons has media related to Neo FreeRunner. This page was last edited on 24 December 2018, at 01:06 (UTC).